Pawan is a Chartered Accountant and carries an experience of over 25 years in senior positions with large organizations such as Sterling Cellular(JV of Essar, Swisscom & Hutch), Reliance Telecom & STEL. As CFO he was instrumental in setting up JV between ABlnBev (the no 1 Beer manufacturer in the world) and Jaipurias for manufacturing beer. 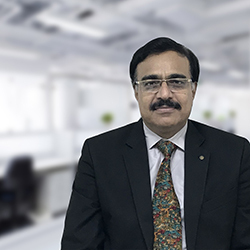 His experience encompass a cross section of industries prominent among them are; media, telecom, trading and liquor.Pawan has demonstrated skills in developing business models for new industry segments, cost optimization, budgetary control & MIS framework. He has successfully arranged funding from banks/ financial institutions on multiple occasions.